First of all, what’s with all the attempts at humour? I just have to try! Laughing has always been something that I value – an irresistible attraction. The reason I got married is because I found someone who laughed at my jokes! What ranks above getting people to smile at the absurdity of the situations they find themselves in? It’s the ultimate drug with only positive side effects. Humour is subjective, personal and cultural which makes it challenging but so worth the effort when it connects. My goal is to combine quality photos with interesting stories that feed off each other. A picture may be worth a thousand words but I’m betting that a few words added to a photo make it more interesting. Perhaps only a writer would come to that conclusion. Why only wildlife or nature photos? I’m following my passion. It’s hard to describe the absolute thrill of watching wild animals in a natural setting – but I try every week. Why do you keep posting? I have thought about quitting occasionally but I keep getting drawn to blogging like Saskatchewan mosquitoes to exposed skin. When I started blogging on April 1, 2012 I decided I to post twice a week until I ran out of photos and then cut back to once a week. It still hasn’t happened. I get a great deal of satisfaction when I hear of someone who laughed at one my jokes, identified with one of my stories, enjoyed one of my photos or, on rare occasions, was inspired in some way. That feedback fuels my desire to keep creating and having fun with it. It’s actually a lot of work but I enjoy it. I wonder what it’s like to be able fly anywhere at will? Do you write for your audience? After spending many years in corporate communications, I learned the value of identifying and understanding the most important audience and then tailoring the key messages and communication tools for them. I like to stick close to that principle in whatever I do … except this blog. Strange! I blame it on the fact I wasn’t sure I would ever get an audience and now I just keep going. Or, maybe closer to the truth … the blog is a great creative outlet for me! I have to say that the comments I’ve received and the connections I’ve made through blogging have been far beyond anything I ever expected. I appreciate every person who stops in to checks it out. How do you decide what to post? I post what I would want to see and read – the things that would get me coming back. I put the effort into making good photos and writing pithy text to make sure the content is blog worthy – at least by my standards. I have chosen to do it less often to try to maintain quality. Time is precious – I don’t want to waste anyone’s time if they come to visit. I’m pleasantly surprised when others share my interests. At the same time I’m confused why the whole world isn’t rushing to my blog … but then I remember I sometimes have eclectic tastes and I’m not good at social media marketing. Much to my shock, I have also discovered that not everyone is enamored with wildlife. How confusing is that!!! The view with the falls behind me. It pays to look around and enjoy it all. Can you smell the fresh air? Where did you get this wildlife photography obsession? In a recent post, I officially blamed it on the bears we found at the dump in a national park when I was a kid. Seriously, I have no idea. There is no explaining why I like crunchy peanut butter, the feel of a new camera or a bear crashing through the trees. I just do. I do know that it’s hard to top the thrill of being alone in some beautiful natural setting, finding wildlife in my lens and capturing a magical split second in time. Some people tell me there are also thrills to be found in playing golf or fishing – I will never live long enough to understand that! You seem to mention being alone a lot. What’s with that? I am an introvert so spending time alone, particularly in nature, is highly invigorating. You can’t change hard wiring! Where do you get your ideas for posts? I usually start with some good photos and then try to come up with a story that fits. I’ve also started to think about the blog when I’m out shooting. Sometimes I write up an idea and go hunting for photos but that’s the exception. Often it’s hard to find ideas but then inspiration comes and with it the fun phase of building on it. Inspiration can be elusive and hard to locate. It’s like chasing enthusiasm – it’s often not where I expect to find it and, if I analyze it, it disappears. Getting into a happy state by listening to music while sitting at the computer usually helps. When I’m on a roll, posts just seem to come and I’ll have a whole bunch ready to go. When it’s been a while since I got some fresh photos, then I may go through a phase of just in time. I’m a planner so I much prefer the former. Soaking wet but still a smile on its face. Nice. Are you obsessed with stats like many other bloggers? In the beginning I was mesmerized by the idea that my mom and I weren’t the only ones checking out the blog so I carefully watched my stats. Then WordPress featured my blog in a couple of different ways and my stats hit soaring heights (at least for me) before crashing right back down. It happened both times. I got a little tired of the roller coaster so I started focusing on the number of likes. Then I discovered WordPress users could like a post without even opening it. Now I’m much more appreciative of the comments because it provides personal interaction and I know people have put in extra effort to write them. I really enjoy the interaction and spend the time to respond to people. Of course I still enjoy the likes and all the visits and it’s not like I’ve quit checking my stats page! How did you find this interview? After doing hundreds of media interviews where I didn’t know what the questions were going to be, it was so much easier to control both sides of the mic! Why didn’t I think of this sooner? Since I am relatively new to your blog, I started going through your older posts (helping you with stats as a plus) because I enjoy your humor and stories. Your photos are really wonderful and as a nature lover myself, I find them inspiring. I kept thinking while reading your answers to yourself, that I am like you in many ways but one. I don’t see myself as an introvert, but I do like my nature walks by myself. Writing for yourself is a good barometer. You must be a very happy person too. So your wife was not one of your readers? My husband is not either and does not really understand my photo passion. Oh, and I agree on Likes. I wish more people would not use them if they do not click to read the post. I’m happy to hear you enjoy my photos, humour and musing enough to go trolling around the older ones. It’s always nice to encounter someone else who thoroughly enjoys nature with its many treasures. I wouldn’t necessarily say I am a happy person by nature. I certainly want it but I think sometimes that only when people have seen the other side do they truly appreciate life’s joys and it’s given me a new appreciate of humour and the pleasure of getting other people to chuckle. Actually my wife reads all my posts and sometimes helps me proof them. She has been incredibly patient and supportive of my photography and blogging which makes it so much easier though the obsession is hard for anyone to understand – including me sometimes. I appreciate your comments. Thanks so much for stopping by and commenting. I appreciate your interest. Blogging has been a lot of fun. Glad you enjoyed it. Thanks for the comment. I’m impressed, I must say. Rarely do I come across a blog that’s both educative and engaging, and without a doubt, you have hit the nail on the head. I’m glad you enjoyed it. Thanks for the comment. Another great post Lyle – Great to get a bit of insight into the man behind the Lens and the Keyboard. Thanks for sharing! Thanks. Hopefully it was good insight. I really need to follow your blog more often! Besides the fact that your photos are so incredibly amazing, and your writing, thought provoking, I appreciate that God’s glory is captured and shared with all your followers. Also glad that you have the time to enjoy your passion! I find it enjoyable reading the comments you receive from your readers, and the various details they pick up on that are important enough to them to respond to. I bet that was your most pleasant interview yet! And when all is said and done (is that possible?) it sure helps to have a spouse who laughs at your jokes! Always glad to have you along for the ride. Glad you find the posts enjoyable. It has been good to be able to have the time to take photos and share them with my musings. The peanut butter sandwich with the crunchy lettuce – I haven’t hear about that one. Sounds interesting though with whole I’m thinking the crunchy peanut butter and honey solves most problems. Yes I think it might have been the most enjoyable interview – at least I had fun with it. I am forever grateful for a wife who still laughs at my jokes after all these years. I love your posting style – a few great photos and a short, funny story. All blogs should be this entertaining. I’m glad you do! That’s a powerful description. I appreciate the insight Lyle, and a great little format to use. I actually believed we were much alike, that is until you dropped that little nugget about preferring crunchy! I can’t believe you miss out on the joys of crunchy peanut butter! Glad you enjoyed the post. Compliments duly passed and gratefully received. We had a little chuckle when I added that note and wondered if it would generate a reaction. Glad you you liked the interview and the crunchy peanut butter! I was trying to add a little background colour in case anyone was interested and it sounds like you were. The truth is that I’m probably a lot better at asking questions than answering them. I too wonder what it would be like to fly, but, I’d want to be a sea eagle; do you come across any of those in your wilderness sessions? Creative outlet, yes, that’s the way to go! 😉 And I certainly enjoy your humour! I rarely see eagles though I wish it wasn’t so. They are a special treat to watch and photograph – definitely the bird to be rather than a gull! I think creative outlets are important to foster and grow. And I most pleased that I you enjoy my humour. Is it really humour if no one finds it amusing? Crunchy peanut butter? Really? That might be the only thing your interview revealed about you that I could never have guessed from any of your other posts. 🙂 I always enjoy what you have to say as much as I enjoy seeing your stunning photos! I really appreciate all your comments and so glad that you enjoy my musings and photos. Well I certainly enjoy your posts and of course the wildlife photos. I can also relate to much of what you stated in your ‘interview’. I’m not a pack animal and prefer to be out there in nature by myself and my wife is mostly always along and takes quite excellent photos herself. But I join no camera clubs or organizations and don’t go on group outings. And although we live in what is considered by many the golf and fishing paradise of the U.S., I would rather poke sharp sticks into my eyes then do either of those things. So happy to hear about a kindred spirit in a number of areas. It’s actually funny that you live in an area that promotes a paradise you don’t participate in. It must be fun to do the photography with your wife – I’ll be looking for a guest post on your blog by her. I’m glad you enjoy my photos and musings. I appreciate the comments. There aren’t any bears where I live either but I have been fortunate to be able to travel to places where I can find them. I suppose that makes them even more special. I’m impressed how long you have been at blogging. So many people don’t last nearly so long. You obviously know how to keep yourself engaged in the latest topics. What a fantastic interview (wow you were really prepared for the tough questions)! What a great idea and just works so well with what we’ve come to expect from your posts. I always know a post from your blog is going to brighten my day ~ so glad I happened upon your blog. I’m glad this post fit in well with the rest of them. I’m so pleased that my blog helps to brighten your day – that is wonderful encouragement to keep going. I like the style of your interview. Have you thought of being a politician? I think they also enjoy making up interview questions themselves (and judging from their answers sometimes, they may be making them up too). I thoroughly enjoy your posts, both for the amazing wildlife photos and the humorous and insightful commentary on the foibles and follies of photographers (and their subjects). Your interview failed to touch on one important aspect of your blog life, though, your support and encouragement of fellow bloggers. As a relative neophyte as a blogger and photographer, I have been motivated and inspired by your continuous stream of comments and advice (and I suspect that I am not the only one). I think I would like to see a video version of your interview. I actually went through a phase when I wanted to be a politician but that passed when I figured out what they actually did and how they had to deal with so many annoying people. Maybe there is some residual effect. Laughing at myself is really only the option when I look at things objectively and is probably part of my attraction to humour. I like your quote and I know I will continue to be amused. Hopefully others will be too. I really appreciate your kind thots about my posts and the comments I have left. I’m so glad you have found them encouraging. What the wonderful experience narrated beautifully with beautiful pictures. Looks a great tour! love it. I’m so glad that i found your blog. Almost all posts are so much informative and interesting. Thanks for coming along for the ride – I appreciate it. Glad you enjoy the posts and the photos. You know that I always enjoy your pictures. I usually like them and sometimes comment. I sometimes have posts with more likes than looks, I know what you mean. When I post animal pictures I often think of some of yours. I post camel pics today. I appreciate those comments and I know we share that in animals. It’s nice to be thot of in a good way. I definitely don’t have any camel pics so that’s my next stop. You have many good reasons for wanting to post, and I’m so glad you do! Your photos are always amazing, and having that glimpse of wildlife throughout the week is calming, I think. Your writing and stories that go along with the pictures never fail to keep me entertained, too! Thanks for the interesting post! And I’m very pleased you want to read those posts. I love your description of glimpses of wildlife as calming – that is so true. Thanks for the comments. It’s encouraging to know that you are regularly entertained. Thanks so much. I was hoping people would find it interesting but I find writing about myself challenging so it took a few drafts. Your images drew me in first, but then I discovered your delicious sense of humor and story-telling talent. I’m hooked. I actually envy your ability to add the words you do. I’ll take nature over golf any day of my life. I’m happy someone else thinks nature trumps golf! I’m so glad you are hooked and I’ve been encouraged by your steady stream of comments including those today. You know – I think our processes are similar. Sometimes I know that what I’m shooting will be a post and sometimes I peruse the library and see a set I hadn’t remembered. I think your combination of humor and serious photography really works. It’s great images and great writing. It’s interesting to hear that your process is similar. I often fine the process of doing any fascinating but especially when it comes to creative things. I really appreciate your comments about the images and the writing. I really appreciate the comments. I thot this post was a bit of a gamble but happy to hear you rank it high. Thank you for your comment. I apologize for not being to respond to it appropriately but the translations I have received don’t make sense to me. “Not everyone is enamored with wildlife”?? Why, that’s blasphemy… Very clever post, keep up the good work. Thanks. There must be something we can do to help these folks see the tragic error in their ways. Wonderful post! And I share your passion for nature – always have and always will. It seems to be hard-wired from beginning. Looking forward to more! Thanks. I think it’s good hard wiring – people really miss out if they don’t have it. Wonderful photos, as always! I especially like the one that is making me smell all of that fresh air. Thanks for all the kind thots. I’m happy to hear I’m more than a one-trick pony! The sense of being at that location is so different than the photo that I wondered if resonate with anyone. Glad you liked it. I appreciate the positive feedback. It’s interesting you were a reporter – I should have asked you for better questions! What a great post. I still feel shy about putting myself out there, and am not really sure what that’s about. But, as Angi said: you are an inspiration! Thanks for your inspirational comment. I’m not so much worried about putting myself out there as wondering if anyone is interested. Maybe you could do a self analysis post on your reluctance … or not. Thanks so much. I hope I am able to portray some sense of the special moments I have been blessed to experience. I’m sure you can and do! I’m happy you liked the concept. Stopping power is a good thing though I am pleasantly surprised to have it applied to me. Great idea for a post! Congrats to your interviewer on the interesting questions he came up with 😉 I liked learning a little bit more about you and what motivates you. Also, very nice images as always. I was quite relieved the interviewer didn’t come up with questions that were too tough:) I’m glad you liked the post. I was trying to come up with something to provide a little more personal information in case anyone was interested. Keep it up! Really like the interview! Thanks so much. I’m still having fun with the blog so I’ll keep posting away. Totally love this post!! Your photos are breath-taking!! Since I use photos and videos on my blog, I can so relate to many of your thoughts on what you blog about!! Sometimes, the photos lead the post, and at other times, I can have a post in mind, and look for photo opportunities! I love all of God’s Creation, so I love the wildlife, you share for me to enjoy!! God usually wakes me up with a post in mind…I scribble it down…and let it soar!! God Bless!! Glad you enjoyed the post. I have been privileged to witness some incredible scenes in God’s creation and be able to share them on the blog. I only wish I could could get an idea every day! I listen to lots of Christian music because of the drama team my son and I direct, so many times it’s the lyrics of the songs that give me inspiration…or sometimes sermon notes…usually I get the title in my mind and just run with it!! I type in that little bit as a Draft, and then let it roll around in my mind awhile! I wish I had TIME to write every day, because I have a lot to say, and I feel like I gotta get it out! Ha! But, alas, there are so many other things to get done in this world! Blessings to you! I loved your ‘interview’. And, please, keep on with the humor – it’s enjoyable! Just curious, where was your first image in this post taken? It’s an amazing setting! Thanks. I’ll keep swinging away at my humour attempts and hope to hit a couple now and then. Glad you enjoy it. 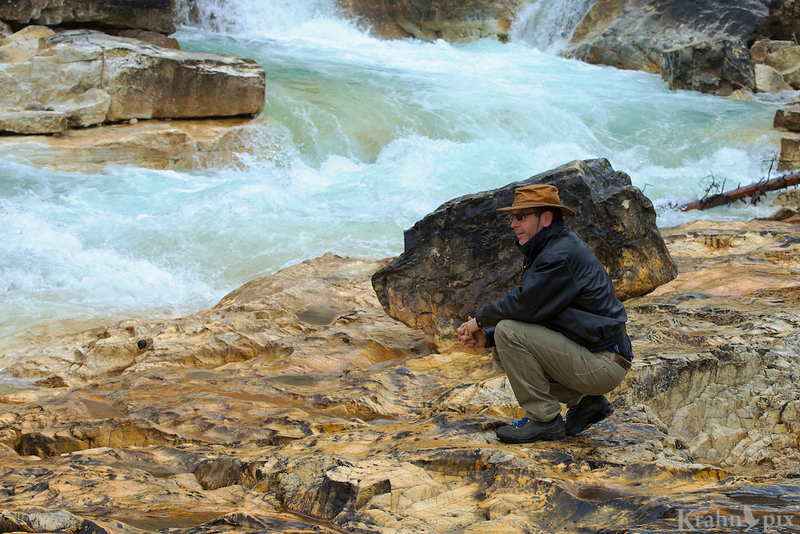 The first photo was taken just above Marble Canyon in Kootenay National Park, British Columbia. It’s one of my favourite spots and we have returned there many times. I really appreciate that. Inspiration is lofty praise. I’m so glad you enjoy the photos. It’s been so much fun to get them and share them.